My first experience of photographing Charlotte and James was for their engagement shoot surrounded by the beautiful woodlands at Stansted. We agreed that we wanted to have an autumnal feel to the photos and it took us three goes to finally find a day that wasn’t pouring with rain. 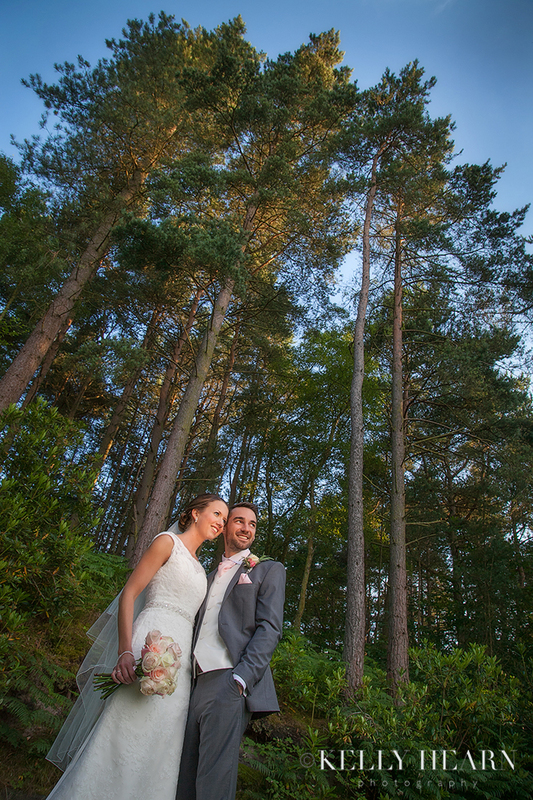 The shoot gave us a great chance to get to know each other and for Charlotte and James to get used to being photographed ready for their big day. I quickly discovered what a lovely couple they were and we had lots of laughs, especially when joined by a chocolate Labrador that wouldn’t stop barking and rolling in puddles throughout the shoot! I learnt that Charlotte and James had found me after looking through my album while viewing Upwaltham Barns; they loved my quirky but professional style. Having had lots of meetings and conversations with the couple, I knew they wanted classic, timeless images combined with the quirkyness they liked when they first saw my work. This suited me perfectly and I couldn't wait to photograph their big day. On the morning of their July wedding I found Charlotte getting ready with her bridesmaids at her parents’ house in Lavant while eating bagels and sipping on Champagne. To put a different spin on Charlotte’s hair and makeup shots, I captured this photo of the three girls together using the reflection in the mirror. I like the diagonal line created through the three of them with Charlotte, as the bride-to-be, at the very centre of it all looking calm and sophisticated with bubbly in hand - a girl after my own heart! 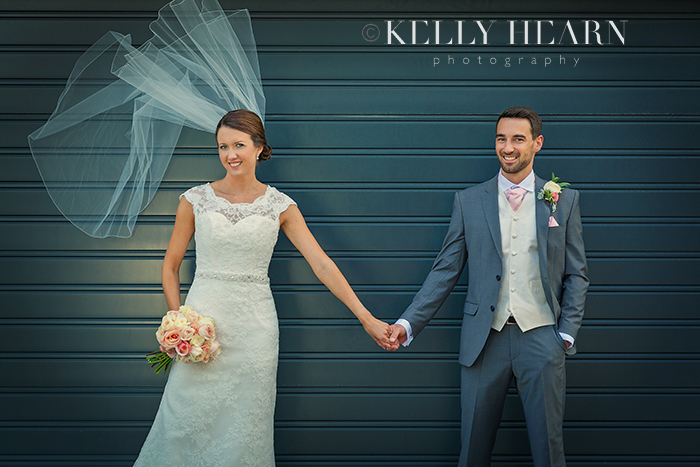 Mark and Catherine’s August wedding was a gorgeous day full of glorious sunshine, lots of laughs and magical moments. The wedding took place at the stunning Upwaltham Barns near Petworth; the perfect venue for their pretty pastel countryside theme which included an abundance of flowers and rustic inspired details. I first met this lovely couple for their engagement photos at Goodwood, this was where they first met which made the shoot even more special. 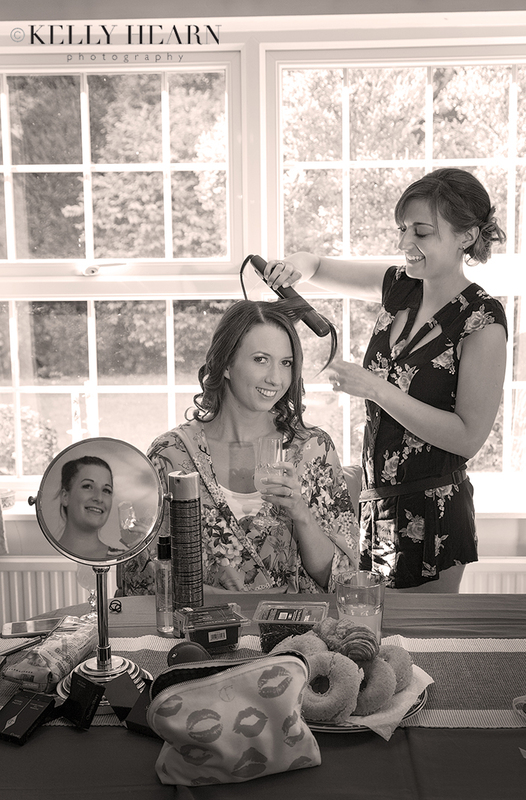 On the big day, Catherine had chosen to get ready at their home in Clanfield surrounded by her bridesmaids and family. The girls all had loads of fun together being pampered by hairdressers and makeup artists before they headed to Upwaltham Barns. Catherine literally could not wait to get to the venue's luxurious bridal suite, Jasmine Cottage, to add the finishing touches to her look and slip into her dress! While Catherine was making her final preparations, I went to see Mark and his groomsmen who were all suited and booted, and looking very smart indeed. 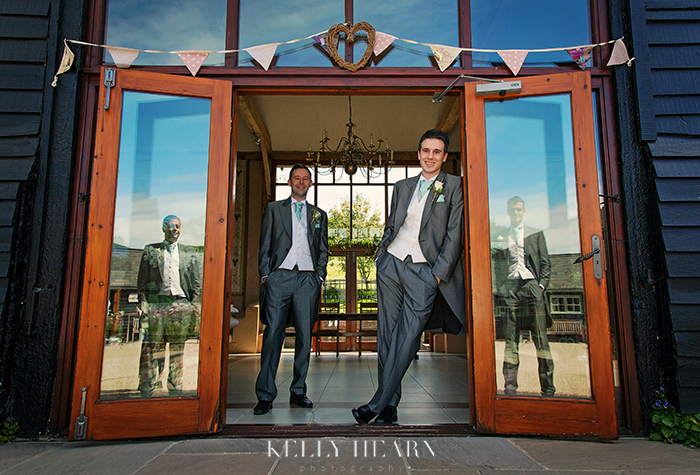 We wanted to capture a few photos of the boys together around the barns before guests arrived. I knew from talking to Catherine and Mark at their planning session that they wanted me to capture a mixture of timeless yet contemporary images, allowing their personalities to shine through. I particularly like this image taken at the entrance to The East Barn. Mark and his best man are in the full shot while you can still see the two other ushers in the reflection of the glass doors. I always love experimenting with the composition of photos and looking for the unexpected, I was really pleased with how this one worked out.